It is a strange world where, as a society, we are prepared to pay more for bottled water, in many cases shipped in from France, than we are for milk. Bottled water represents the ultimate in fatuous food miles, whereas milk is a staple food and should be valued as such. Whether you are a conventional or an organic dairy farmer, the overwhelming problem has for some years been price. Between 1997 and 2008 the number of dairy farmers nearly halved, the GROSS profit per cow fell from £933 to £697 and in some years there was a NET loss. The shift in power from producer to retailer is being seen all over Europe and knife-edged margins have forced remaining farmers to extract every last litre of milk from increasingly stressed animals. They have become more efficient, but not rich. 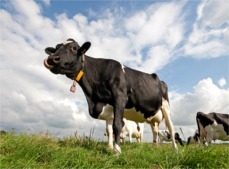 Nearly 90% of all UK dairy cattle are now of the high-input, high-output Holstein type. Whilst the current situation continues, it is more important than ever to reduce dairy overheads and maximise the nutritional benefits of home-grown forages and cereals. Field Science can help in several ways. The variation in technical performance between farms with similar production systems can be as much as a third. That third encompasses not only attention to detail, but primarily feed input quality, because so much downstream efficiency depends on it. 1. Mineralising the land that is used to grow grass, forage crops and cereals produces feed that is correctly mineralised, so needs no mineral supplements. Two advantages stem from this; it saves money and the minerals are absorbed more readily, because they are in natural, chelated forms. Taking selenium as an example, less than 50% of inorganic selenium supplement is absorbed in the digestive tract compared with selenised forage. 2. Better home-grown quality reduces the physical amount of ration the cow needs, leading to reduced consumption of bought-in concentrates. 3. Higher quality food reduces stress, mastitis, cystic ovaries and cell counts, to say nothing of improved feet. This extends the productive life of the cow. 4. Breeding quality replacements becomes easier as fertility improves and need not be expensively out-sourced. As stated, the vast majority of UK dairies rely on the Holstein with a bit of British Friesian often thrown in. These animals cannot operate on pastures alone and certainly cannot achieve their prodigious milk yields without high energy extra feed concentrate. The extreme Holstein type has been bred solely for milk yield and undesirable traits have crept in. It is very prone to lameness due to udder size and poor rear conformation; to mastitis, a mild case of which costs £150-200, a severe one £450-500 and leads to infertility. The average lifespan is 2.7 – 3.0 lactations and the replacement cost for a mastitis fatality is £1,700. There are two ways the dairy farmer can stay in business in the current climate. One is to embrace the high-input, high-output model using the big yielding breeds, either Holstein or the increasingly fashionable Brown Swiss. This is a highly skilled and highly technical operation but with dedication and attention to detail it can be profitable, with economy of scale. The other way is to look to the traditional grass fed breeds, such as Jersey, Guernsey, Dairy Shorthorn or Ayrshires. This system particularly suits the smaller dairy. The lower milk yields attainable from these breeds are offset by their ability to thrive on a diet of grass, hay, silage, straw and home-grown forage crops. Other advantages are longevity, lower somatic cell counts and ease of breeding, both replacement heifers and viable beef crosses. It is a system that should be considered by existing dairy farmers who are struggling, but do not want to join the exodus and who already possess an infrastructure that would support a more extensive approach. Whatever the choice, Field Science can maximise the nutritional value of your land.